Likud ad pledging to end noisy Muslim prayers in early morning is nixed for offensive content. A Likud ad promising to end loud Muslim prayers in the early morning hours has been nixed by Supreme Court Justice Salim Joubran, who heads the Central Elections Committee, Maariv/nrg reports. The ad reads, “Silencing the muezzin in Yafo? 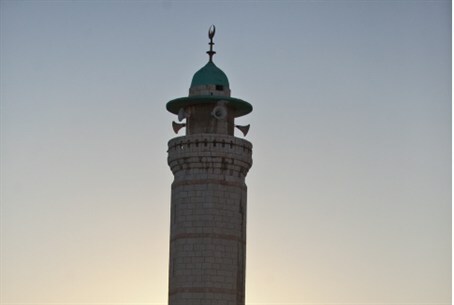 Only the Likud can.” The muezzin is the prayer leader who broadcast the Muslim call to prayer over a loudspeaker five times a day. Member of Knesset Omer Bar-Lev of the Labor party complained to the Elections Committee about the ad. Joubran disagreed. “This campaign will almost certainly be highly offensive to the Arab-Muslim population of the state of Israel,” he determined. Joubran’s decision set a new precedent of allowing the Elections Committee head to ban ads that he or she decides are racist in any media, including online. Sources in the Likud Beyteinu faction in Tel Aviv told Maariv that they regret Joubran’s decision, and plan to appeal. “Instead of silencing the muezzin in Yafo, the committee has decided to silence the voice of Yafo residents. Whoever has not been woken up in the middle of the night because of the noise pollution created by the muezzin cannot ban a legitimate political campaign, which is within the boundaries of free speech, regarding a hot issue on the public agenda,” a statement from the party said. The issue of the muezzin call to prayer has become a hot topic in Israeli politics in recent years. In the last Knesset, MK Anastassia Michaeli put forth a bill that would limit the use of public broadcast systems, including those used by mosques. The issue has been raised by city council members in Jerusalem as well. City Council member Yael Anteby has warned that lack of enforcement of noise laws when it comes to the muezzin has created an “unbearable” situation.